Electronic Leak Detection & Field Vector Mapping, Roofing & Waterproofing Consultants - Honza Group Inc. - Electronic Leak Detection & Field Vector Mapping, Roofing Consultants - Honza Group Inc.
With innovative leak detection equipment, electricity can now be utilized to follow the path of a leak and will allow its exact pinpoint location without the application of hundreds or thousands of gallons of water as used in traditional flood testing. Electronic detection locates breaches through a waterproofing membrane by measuring, or more accurately, following electric current across the surface of the membrane. A wire loop, to act as a conductor, is placed directly on the membrane or the membrane's protection course around the perimeter of the area to be tested. One of the two leads from a pulse generator is connected to this wire loop conductor. A second lead from the pulse generator is grounded to the structural deck. 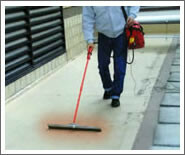 The surface of the waterproofing must be wetted (not flooded) to provide an electrically conductive medium. Every few seconds a low-volt charge is delivered from the pulse generator for one second. As a result, an electrical potential difference is set up between the roof surface, which is wet, and the roof deck, which is "earthed" or grounded - essentially producing two electric plates. If there are any "leaks" or breaches through the waterproofing membrane, which acts as an electric insulator, the small electric current will flow across the membrane surface and down through the breach, completing the circuit between the two "electric plates." A technician uses a receiver connected to two probes, to identify the direction of the electric current. By moving the probes the technician is able to systematically follow the flow to even the smallest breach or leak through the membrane. 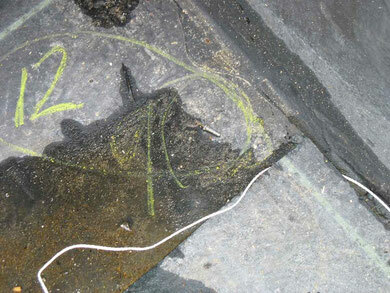 Once located, the breach in the membrane can be repaired and quickly retested. Specification on Low Voltage Electronic Leak Detection, or sometimes referred to as Electronic Field Vector Mapping. The problem of water penetration through roof assemblies is common to many buildings. 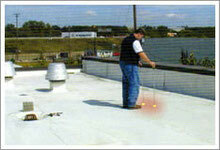 Low slope roofs, commonly referred to as 'Flat Roofs', have a disproportionate share of leaks due mostly to the fact that they are expected to not only prevent water penetration, but also to act as a walking surface and in many instances as a work platform for the initial construction of the structure as well as the ongoing repair and maintenance during a buildings life. When the inevitable leak occurs, the only viable non-destructive methods of locating its point of entry were to implement compartmentalized flood testing or a 'Trial and Error' technique. The 'Trial and Error' procedure would deduce the approximate location of the leak based upon the roof and roof deck assembly as well as the characteristics of the leak. This approximate location would then be investigated on hands and knees and all possible deficiencies that could cause the leak were marked and repairs made to all potential leak sources. This type of leak detection was not always successful and often had to be repeated numerous times before the leak was found and repaired. The power source like Low Voltage ELECTRONIC LEAK DETECTION is still grounded to the conductive deck, and the membrane acts as an insulator. When the broom head which is made of small conductive bristles makes its way over a breach in the membrane the circuit is completed, allowing current to flow and the power source then emits an audible tone to alert operator. When the bristles have located a breach within the area of the broom, the operator will then sweep that area again, however this time the contact area is reduced to pinpoint the exact location. A continuous higher voltage charge than produced by the low voltage pulse generator is delivered from the generator to the piece of testing equipment. With the electrical potential difference between the grounded roof deck and high voltage testing equipment we essentially have two electric plates. If there are any breaches or punctures through the waterproofing membrane, which acts as an electric insulator, the electric current will ground itself at the breach. No water needs to be used in this method of testing. It will locate the precise locations of breaches, which makes this testing non-interpretive. Both pieces of equipment can find breaches undetected by the naked eye. Locates breaches undetectable to the naked eye. Less time consuming than flood tests. Testing not impacted by steeper slopes. No wetting of the roof required. Roof must be dry. Faster less cumbersome test method. Only effective on un-ballasted thermal welded membranes. Specification on High Voltage Electronic Leak Detection, or sometimes referred to as Electronic Field Vector Mapping. Overview of Low and High Voltage Electronic Leak Detection, sometimes referred to as Electronic Field Vector Mapping. A Quality Assurance Tool. Descriptions and uses of Electronic Leak Detection (High and Low Voltage) (Electronic Field Vector Mapping). Electronic Leak Detection also referred to as Electronic Field Vector Mapping - Case History.